The braai, the big divider and unifier of South Africa. The first debate about the braai (BBQ to my non South African readers) is charcoal or wood. And once you have come to the conclusion that wood is the way to go, the type of wood you are going to use is the next big debate. And then we have to work out, is the BBQ indoors or outdoors. Because, every day is braai day in South Africa. We have what I call a boys braai. This is an outdoor braai, at the edge of the patio which uses wood (or charcoal in a crunch). It is where the boys gather when we have friends over for a braai. And therein is the next divider. Away from the Cape a lunch time braai means just that – we will eat at lunch time. In the Cape, a lunch time braai means we will light the fire sometime after lunch! And because we love to braai, an indoor braai makes a lot of sense if you have summer rainfall, or winter rainfall. And so, we have a gas braai which will serve as our ‘indoor’ braai when the house has been completed. It will be under the roof, between the glass door leading into the lounge, and will have a glass pane alongside it, to keep out the weather. The next hurdle to overcome is what goes onto the braai, and how to serve it. Dave and I are insistent that as soon as the meat/chicken/fish comes off the braai it must be eaten. There is no waiting around, or putting of food into a roasting pan into the oven to keep warm. And then, what do you serve as side dishes? The most traditional side dish would be mielie pap if you are from Transvaal (now known as Gauteng) and of course there will be salads, especially potato salad, as no braai could be complete without one. And in the Cape, some people will serve braai broodjies before the meat is done, or to go with the meat, but this is another divider. I had never seen braai sandwiches until we moved to the Western Cape. And I was not particularly enamoured by them as traditionally they are bread filled with cheese and onions. But for something different for the grill and an excuse to ‘light the fire’ (not that we ever need one), I decided to make braai broodjies that we would enjoy as a lunch time meal. Blog-checking lines: With summer just around the corner, ML Spell from Dry Spell invited us to play with fire! She challenged us to make some mouthwatering eats on the grill for the June daring cooks challenge. Your sandwich looks delicious. I’ve been collecting different sandwich recipes for a few months now. I can’t wait to try your recipe. Tandy, thanks for introducing us to a little bit of South Africa good eats. Loving this simple and delicious toasted treat. This would be a great after school snack for the boys, easy and quick. I’ve neverheard of Braai Broodjies!Looks so tasty I wanna eat it right away! I can see why you may debate over what to use, but whatever you used to make this sandwich… I am all for it. It just looks amazing. I’ve never heard of it but I sure do want to try it. 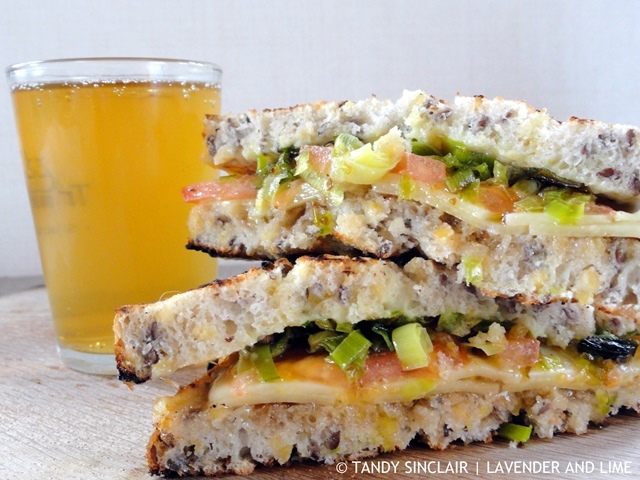 Mmmm – a delicious grilled cheese sandwich – Tandy – love the leeks in there. Delicious Tandy! It looks like mustard seeds on that sandwich. Interesting to learn about Braai Broodjies. Braai sounds like a fun time, and I’m sure any one where you’re cooking would be fantastic! The broodjies look delicious!! 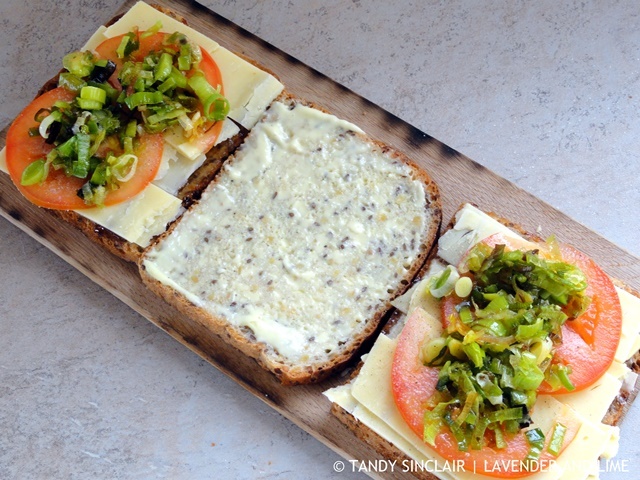 Love a good warm sandwich, so no matter what you cook this on, I will happily eat it! This is such a unique grilled cheese- and it’s beautiful, too! Pete would braai 7 days a week given half the chance. Thankfully we also have an inside and outside braai and Pete will ONLY use wood. I love the idea of “braiing” regardless of the weather – inside, outside, all year round…marvellous! Krista, I shall find a way to insert voice clips! What an interesting recipe, Tandy. Thank you for teaching me about broodjies!